Located in the Indian Ocean off the east coast of Africa, the Seychelles are a group of 115 islands that are basically the definition of paradise. 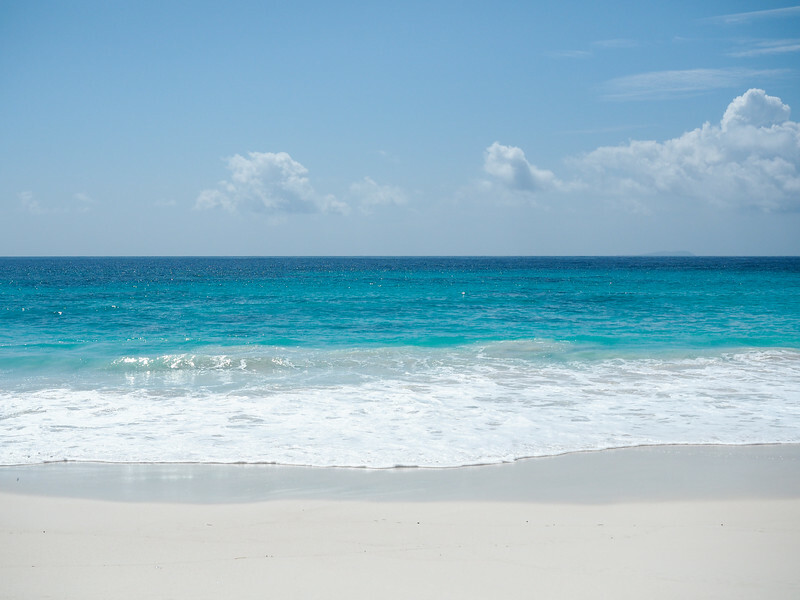 White sand beaches, warm turquoise water, giant tortoises, and all the palm trees await you there. And while the Seychelles are most often associated with honeymoons (Prince William and Kate Middleton vacationed here after their 2011 marriage), the truth is that there's SO much more to the Seychelles than just romantic beach resorts. In fact, to truly experience these islands, you really need at least a week in the Seychelles. 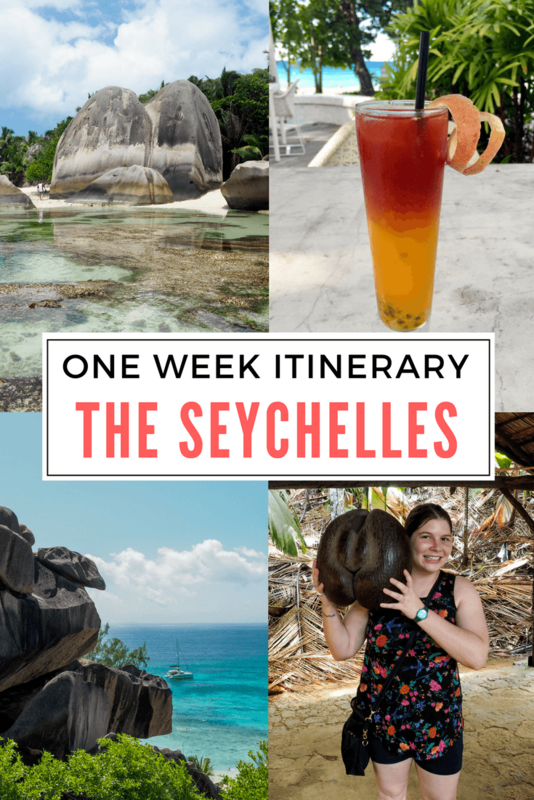 Lucky you, though, that I've put together the perfect Seychelles itinerary for one week in the Seychelles! Here's everything I think you should do with a week in this island paradise. 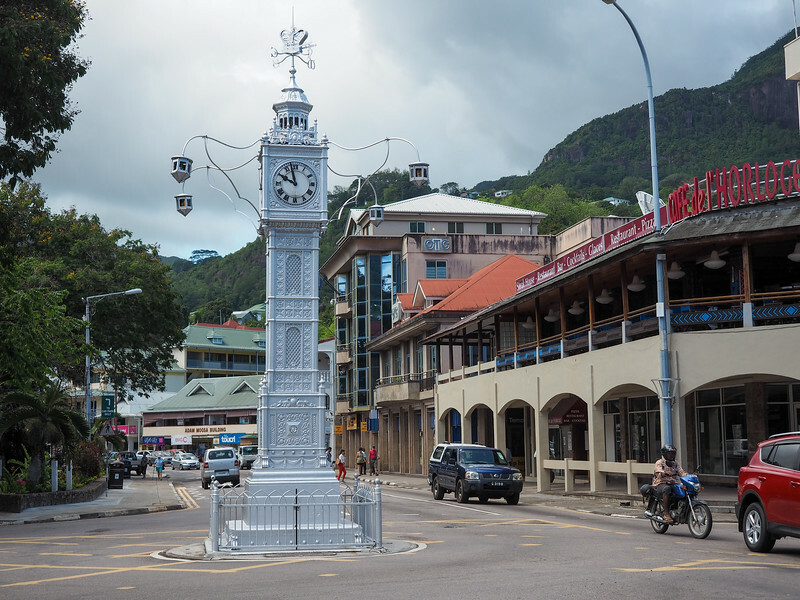 Getting to the Seychelles can take a bit of time depending on where you live, but there are more connections to the island nation than you probably expect. There are direct flights from places like Johannesburg, South Africa; Dubai, UAE; Frankfurt, Germany; Paris, France; and soon London in the UK. I flew from Boston to Dubai, and then Dubai to Mahe International Airport. 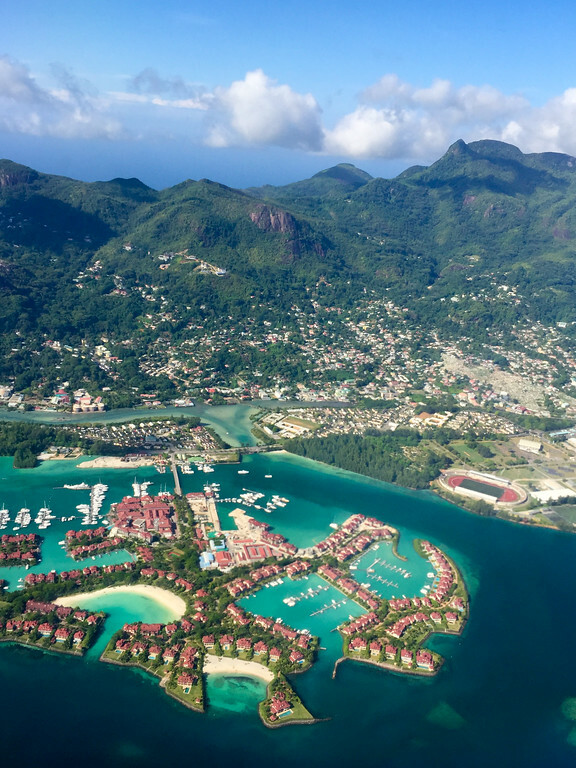 Depending on where you're flying from, you'll arrive on Mahe (the largest island in the Seychelles and home to its only international airport) in the early morning or early afternoon. From the airport, you can grab a taxi to your hotel. If you arrive later in the day like I did, I recommend spending the rest of the day enjoying your hotel and maybe visiting a beach for sunset. 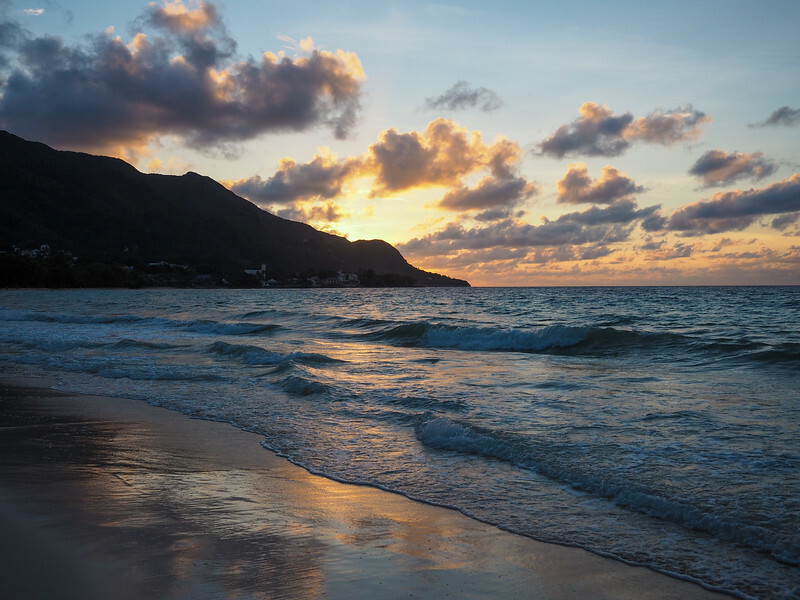 I stayed at a hotel that was just steps from Beau Vallon Beach, which is the most popular beach on Mahe for sunsets. There are lots of places to choose form on Mahe, though. 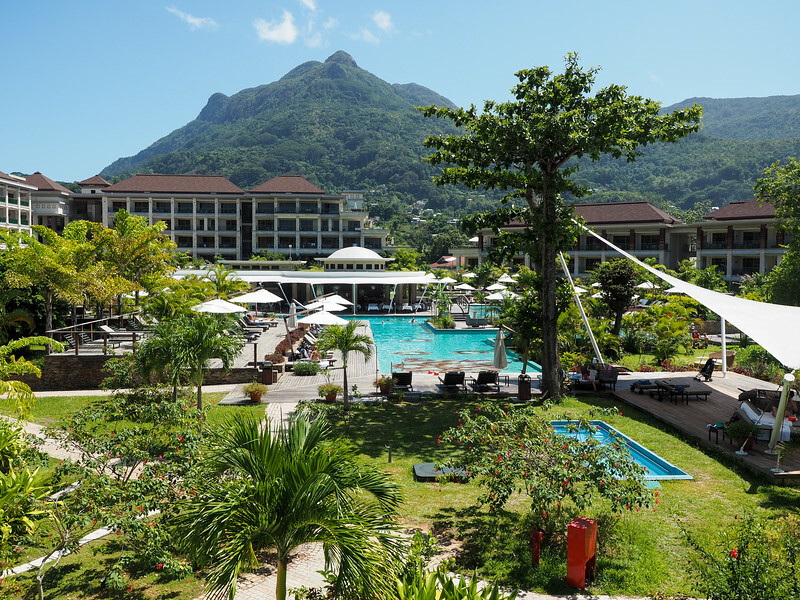 Also on Beau Vallon Beach is the H Resort (the highest-rated Beau Vallon hotel), and I had a great lunch and tour at the nearby Carana Beach Hotel, which has the most affordable rooms with private plunge pools on the island. 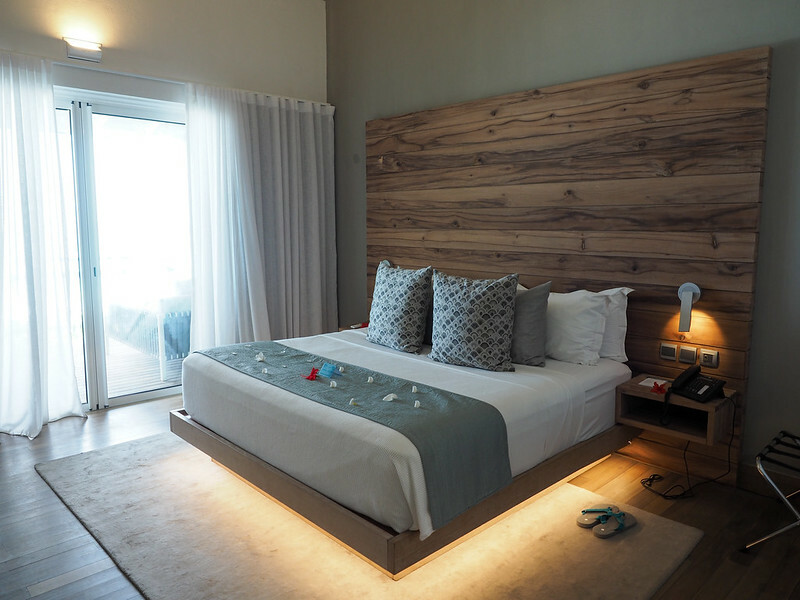 For those looking for luxury, Mahe has both a Four Seasons and a MAIA Luxury Resort & Spa. And for more mid-range options (that are still super luxurious), there's the Kempinski Seychelles Resort, Le Meridien Fisherman's Cove, and a Hilton property. I think a lot of visitors to the Seychelles treat Mahe as the airport and that's it, but the truth is that there's a lot to see and do! Mahe has an excellent mix of beaches and jungle, and deserves at least a full day of exploration. Ferries run frequently between Mahe and Praslin, or you can also fly between the two. The ferry only takes about an hour, though, and is more of an adventure. Take a morning ferry from Mahe so you can have the whole day to explore Praslin. From the ferry dock, grab a rental car or taxi and head straight to the Vallée de Mai, a national park and UNESCO World Heritage site. 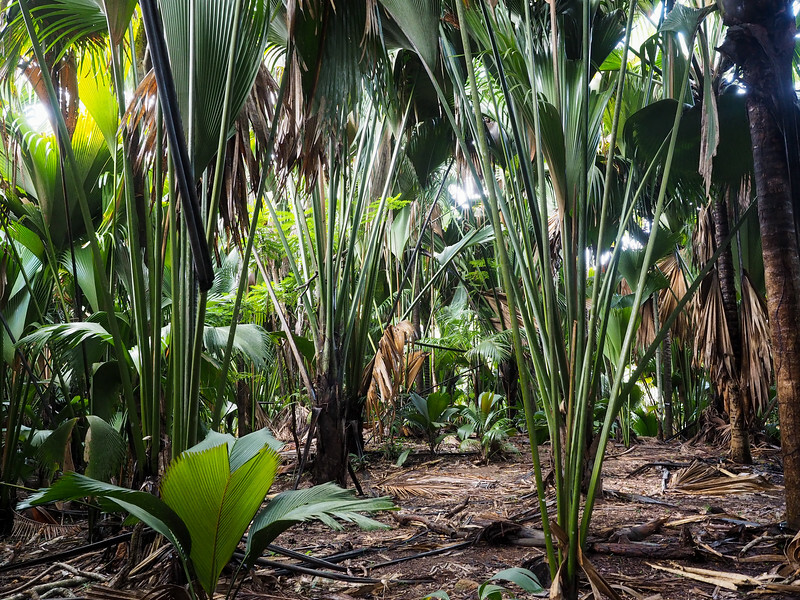 This is a nature preserve filled with rare coco de mer palms – they're so rare that they only grow in the Seychelles! They also produce the largest, heaviest seeds/nuts in the world, which are pretty cool to see. 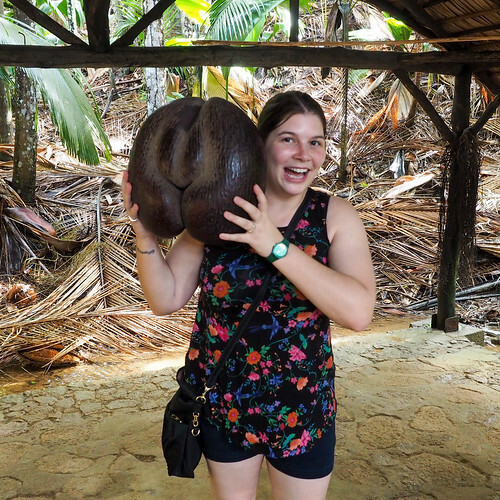 It's worth it to hire a guide here so you can spot not only the coco de mer palms, but also all the other unique flora and fauna like orchids and black parrots. 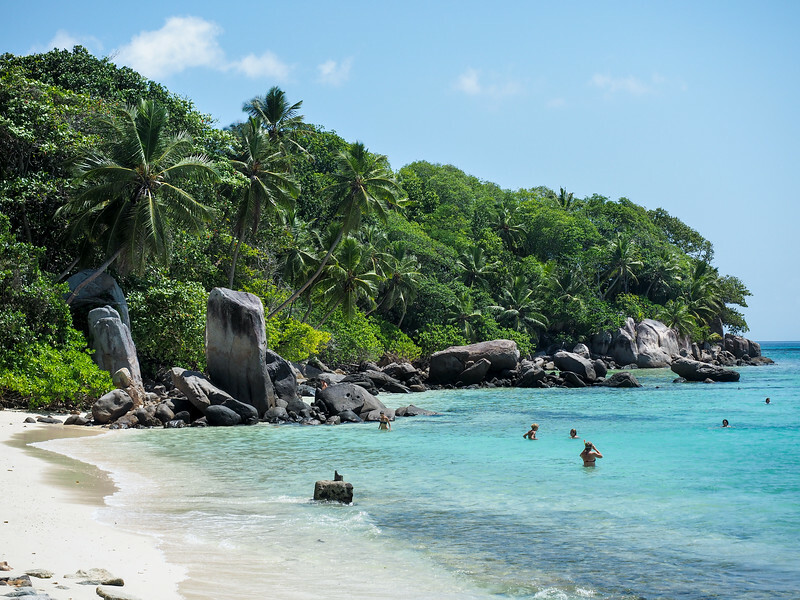 After the Vallée de Mai, head to Praslin's most famous beach: Anse Lazio. 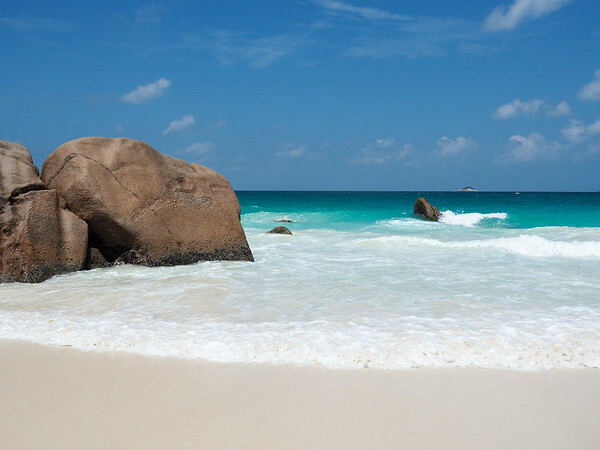 This is usually regarded as one of the best beaches in the Seychelles, and it's not difficult to understand why. 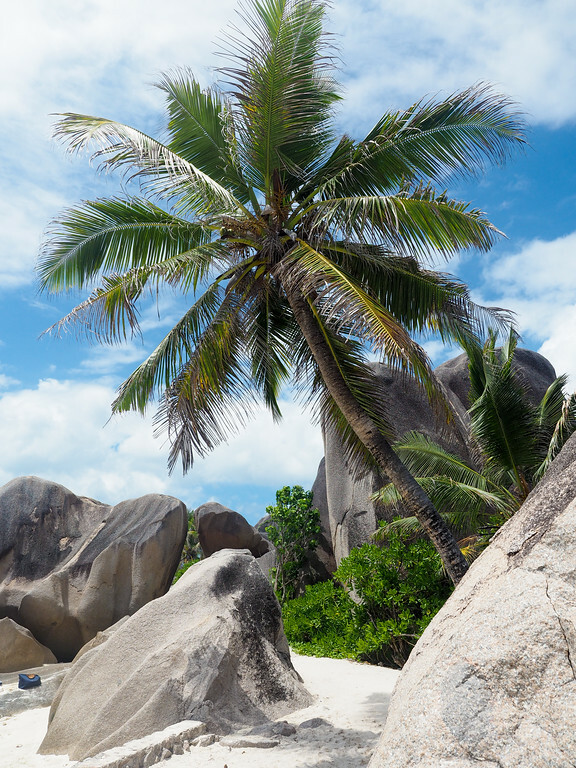 Anse Lazio is characterized by white sand, turquoise water, rusty-red boulders, and plenty of shady palm trees. Have lunch at Bonbon Plume right on the beach (go a little early to get a table, and try the red snapper if they're serving it), and spend a few hours enjoying the sun and sand. In the late afternoon, head to your hotel and enjoy the rest of your evening there. I stayed at Paradise Sun, a 4-star resort hotel right on the beach (Cote d'Or, near Anse Volbert), and would recommend it. The hotel has a nice pool, plenty of beach loungers, and things like snorkeling gear and paddleboards for guests to use. I liked my beachy hut, and enjoyed the buffet dinner I had on-site. For true luxury-seekers on Praslin, go for Raffles (the only hotel on the island where every room has its own private plunge pool) or the Constance Lemuria. Today, take a day or half-day trip from Praslin to Curieuse Island. 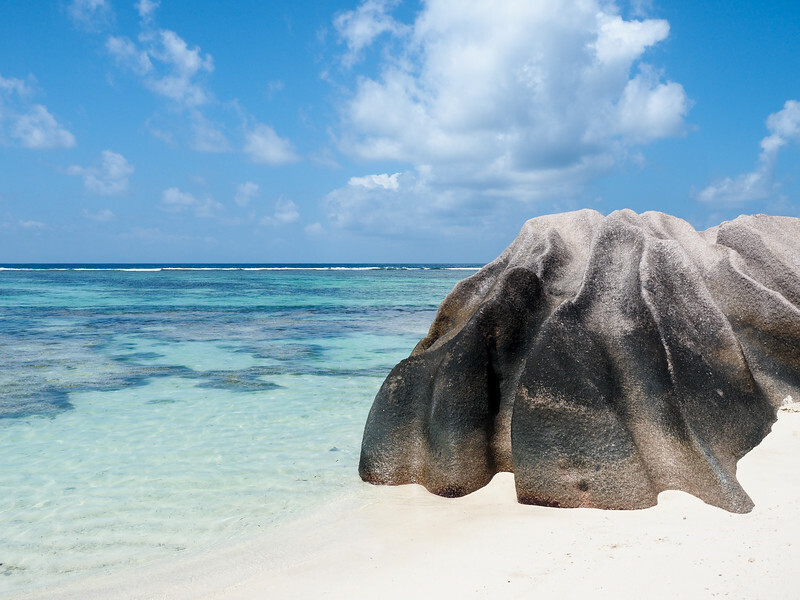 Along with being the only other island in the Seychelles where the coco de mer palm grows, Curieuse Island is also home to a breeding program for giant Aldabra tortoises. 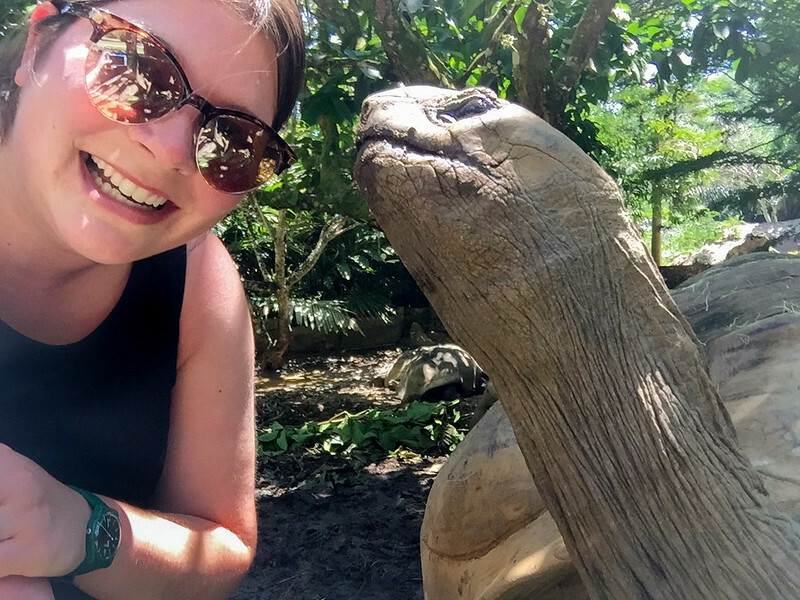 The land giants roam freely here, which is perfect if you want to grab a tortoise selfie! 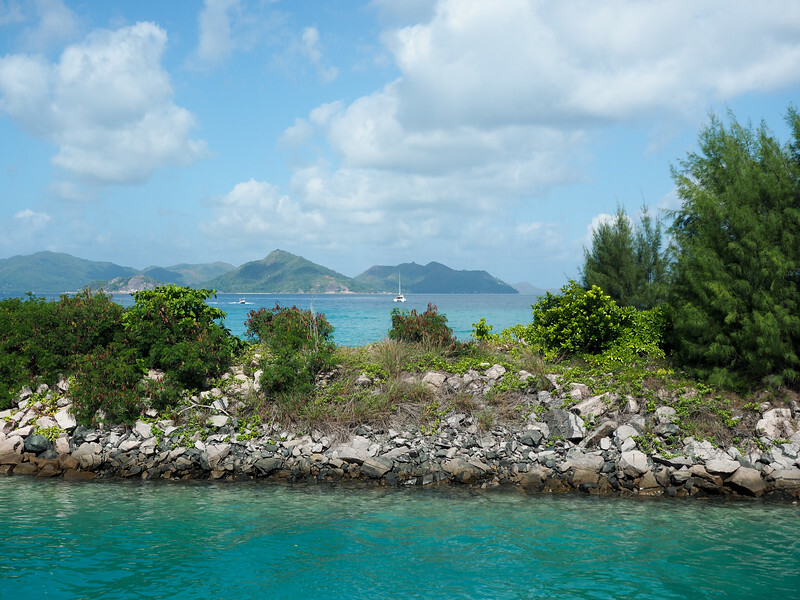 Many people pair trips to Curieuse Island with St. Pierre Island, which is a great place for snorkeling. Check out Tourbookers for tour options. Afterwards, enjoy the rest of the day on Praslin at your hotel or on the beach. From Praslin, it's only a short 15-minute ferry ride over to La Digue, the smallest of the three most popular islands in the Seychelles. 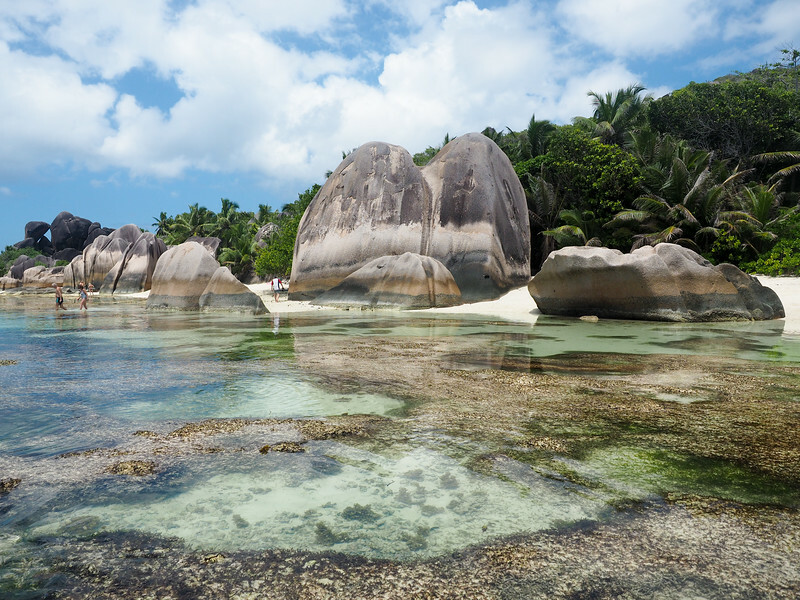 Even though you'll experience “island time” everywhere in the Seychelles, things are even more relaxed on La Digue. There are virtually no cars on the island, and the main mode of transport is by bike. Since you'll be traveling with luggage, though, your hotel will likely offer to pick you up from the ferry and transport you and your things. Afterwards, though, be sure to get your hands on a bike so you can explore the island! 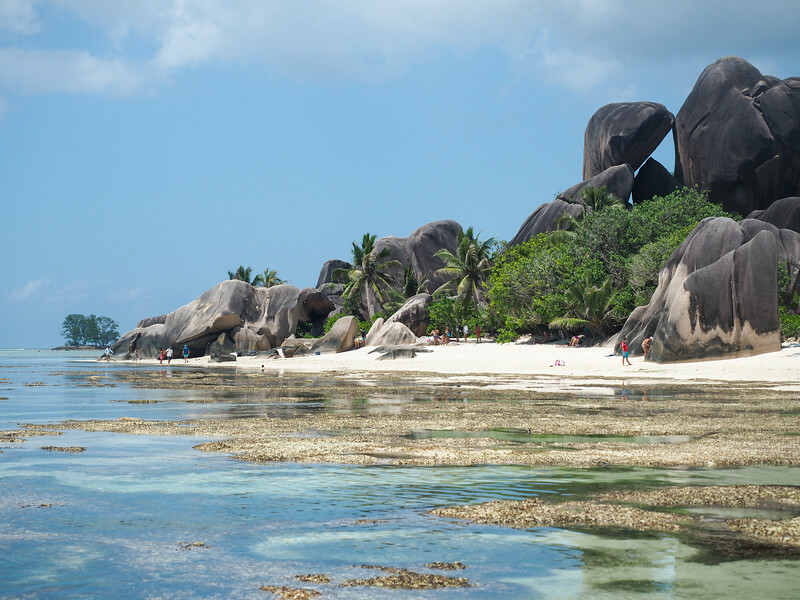 La Digue covers less than 4 square miles, meaning you can easily explore the whole thing by bike. La Digue has a few resorts/hotels, but staying at a guesthouse or B&B is more popular here. 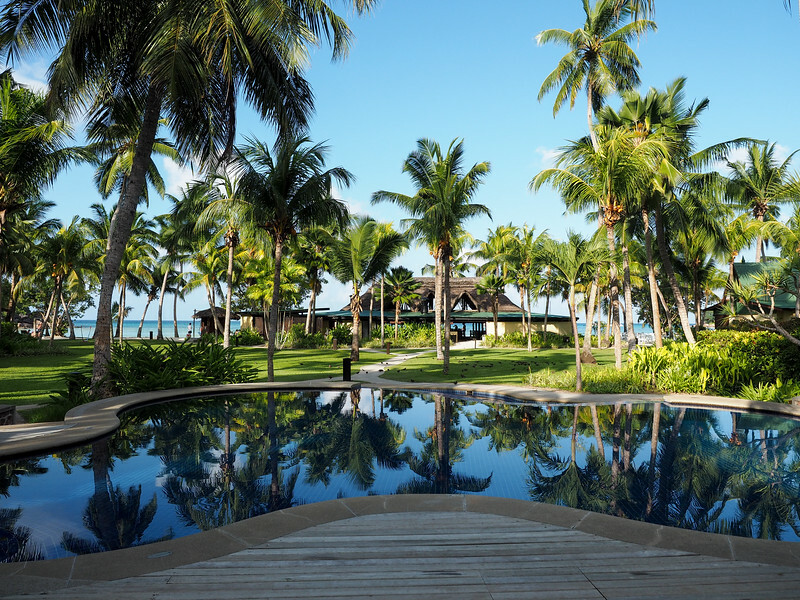 If you want to go the resort route, Le Domaine de L'Orangeraie Resort and Spa is the highest-rated on the island, followed by Le Repaire Boutique Hotel. Or you can check out guesthouses on La Digue. 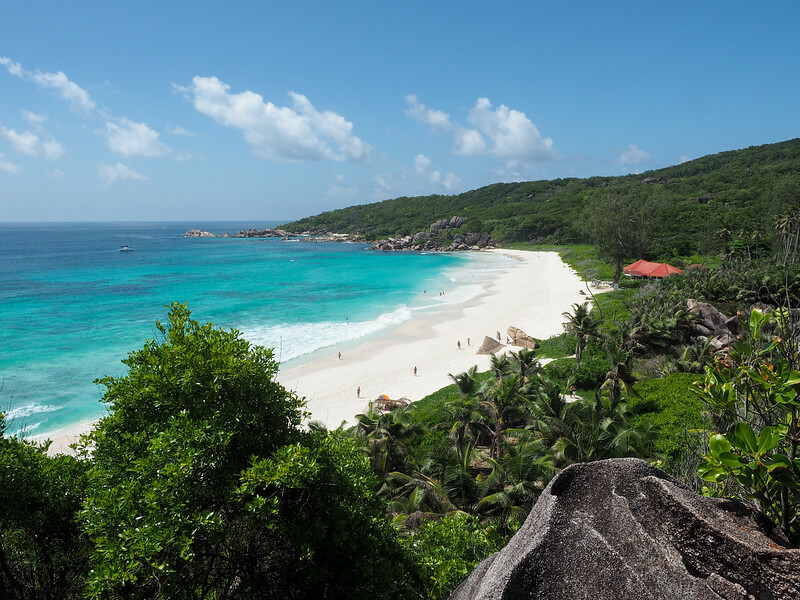 Today on La Digue is all about the island's most famous beach: Anse Source D'Argent. This beach is often said to be one of the most-photographed in the world, and certainly wins my vote for most beautiful beach in the Seychelles. It's an absolute must-do for any Seychelles trip. Anse Source D'Argent does lie on private property, though. You have to pay to enter L'Union Estate (your admission includes a tour through the old copra factory and vanilla plantation), but I think the $10 entry fee is more than worth it. I recommend bringing a picnic lunch so you can spend most of the day here. 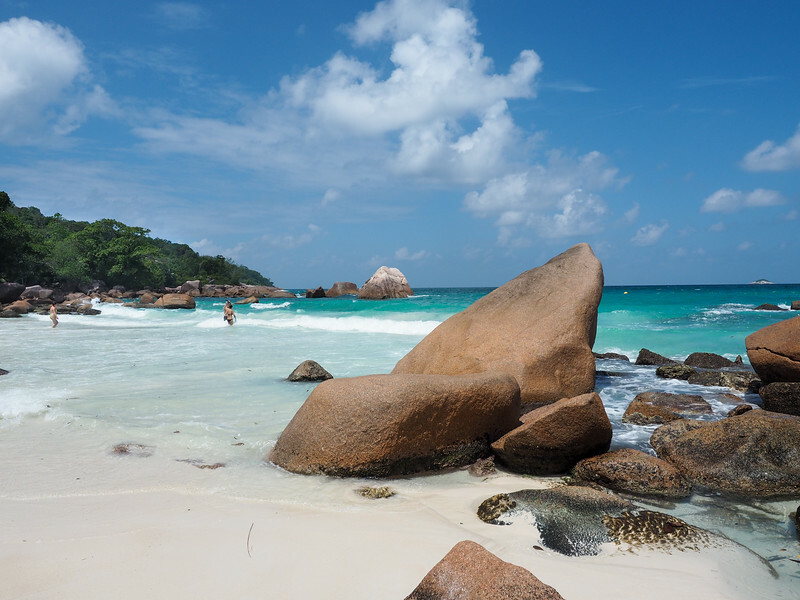 Anse Source D'Argent is a long beach – it's actually like three or four beaches in one because of the different sections separated by giant granite boulders – so you can easily while away the hours exploring, swimming, and napping in the shade. 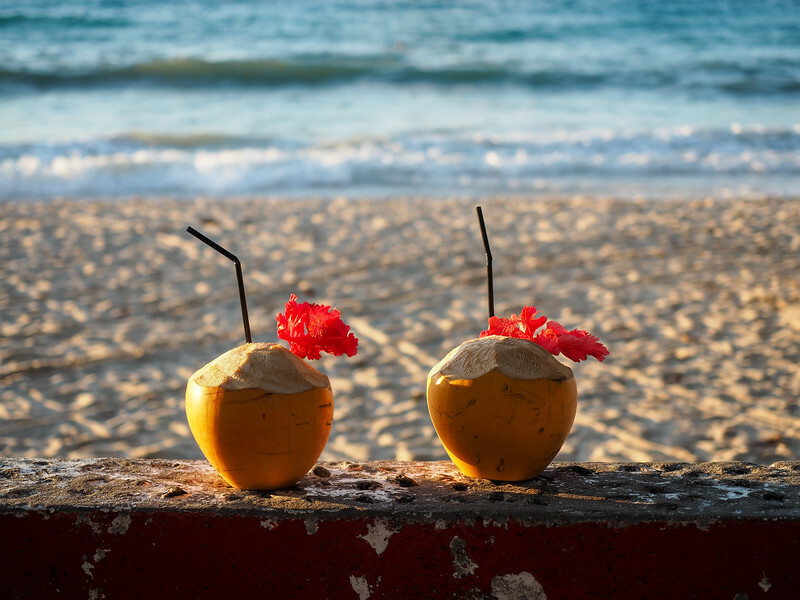 Once you head to the beach, there's no food for sale – but you will find to beach bars where you can grab a coconut, fruit smoothie, or alcoholic cocktail. You could definitely spend your last day in the Seychelles simply lounging by the pool or on the beach, but if you want just one more adventure, consider booking a snorkeling/sightseeing tour from Mahe to the islands in nearby Ste Anne National Marine Park. Tours to the marine park usually include snorkeling and swimming in the reserve, a stop at Moyenne Island to see some giant tortoises, and lunch and cocktails on the boat. This would be a great way to round out your time in the Seychelles. Today will sadly be the day you'll say goodbye to the Seychelles. But don't forget that this island paradise is close to some other fantastic destinations. For example, many people pair up a week in the Seychelles with a safari in South Africa! 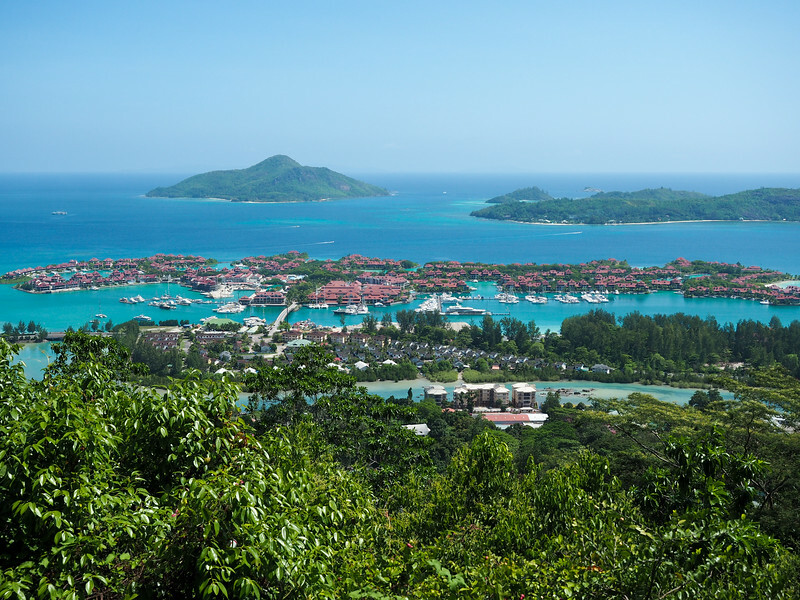 The Seychelles have a tropical climate year-round. Expect heat and humidity no matter what time of year you visit. The Seychelles isn't really a budget destination (though you can certainly save some money by staying in a guesthouse or apartment and self-catering some of your meals). But the good news is that almost all the beaches are free to visit! Looking for more packing suggestions for the Seychelles? Head over to my Amazon shop to see all my favorite travel gear! 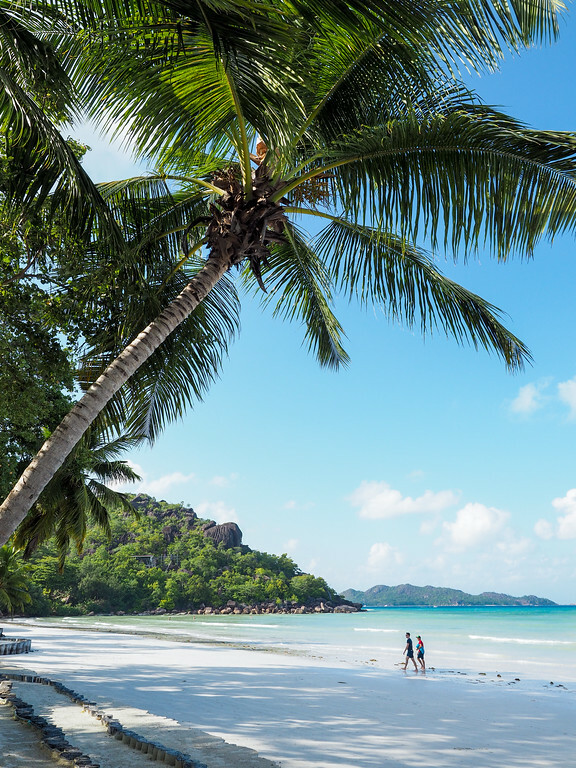 Pick up a Seychelles travel guide before you go. Who's ready to plan a trip to the Seychelles? I love posts like this! I always struggle to think how to organise trips to countries that consist mainly of islands, and even though I read many posts about the Seychelles I couldn’t wrap my head around the logistics of travelling there. I’ll be bookmarking this post for when I plan my trip there! I really enjoy writing posts like this, so I’m glad you enjoy reading them! Hopefully this one will be helpful to others wanting to plan trips to the Seychelles too. FIne, to the point post with beautiful pictures. Thanks for sharing. Great one week itinerary. What kind of budget should a traveler expect if they were to follow your recommendations? Were there any additional “hidden costs” that you did not expect before coming here? Great question, Ray – I should add a section in about prices! The Seychelles isn’t particularly cheap, since it is rather a luxury destination AND because everything is usually pricier on an island. Many of the hotels I’ve mentioned start around $400 per night (often including some meals). The ferry from Mahe to Praslin runs about $50 each way. Meals will run anywhere from $15 to $30 per person depending on where you go. Thankfully all the beaches are free! After enduring these freezing cold temperatures in Michigan this week, seeing these warm tropical photos is making me teary. I enjoy me a good island vaycay every now and then, but I often get bored when all there is to do is lay on the beach. The Seychelles sounds like it has a lot of things to keep you occupied through the week! I’m not a “lay on the beach” type of person, either, and I LOVED the Seychelles. The beaches are so pretty and unique that it was easy to spend hours at them taking photos – no beach lounging required! Plus, there are all the non-beach things to do, too. Hmmm that’s very odd. My hotel recommendations are definitely in the post, and are just included as regular text, so there’s no reason they shouldn’t be appearing assuming you can see the rest of the text. Maybe you can take a look at the post again? (I’m on a Mac and just checked on Safari – everything is there!) My Mahe recommendations are listed under Day 1, Praslin under Day 3, and La Digue under Day 5 of the itinerary. 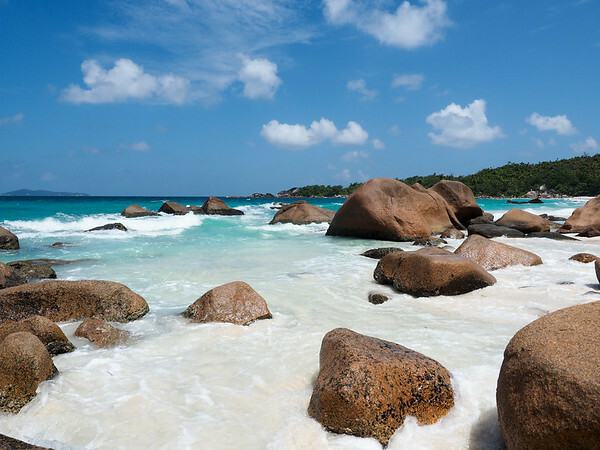 To see these picture I wish to travel at there, and I think I can easily spend 1 month in SEYCHELLES. You could easily spend even longer and see more islands (there are 115, after all), but I think this would be great for a first trip! WOW!! Beautiful pictures. Looks like a beautiful place to travel to. It’s definitely a gorgeous place – it wasn’t hard to take good beach photos here! What an amazing place.. Thanks for sharing Amanda! Loved the pictures and its making me so excited to travel there!! 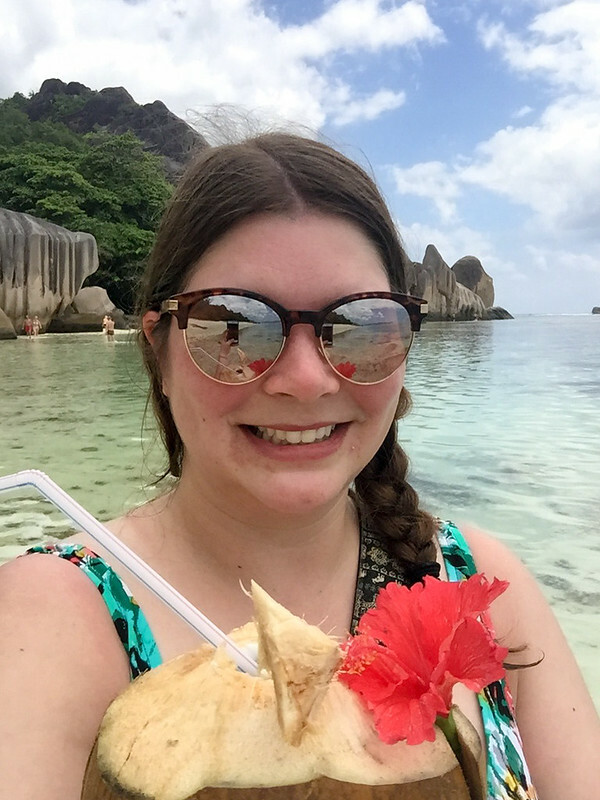 It’s basically paradise – I’d love to go back and visit even more islands! Heading out to the Seychelles in April for the first time in a decade. Can’t wait! I’m sure you’ll get some great insider tips while there! This is legit a dream trip! Do you know if there’s good diving there? The only place I’ve dove in the area of the world was Mauritius and it was a bit underwhelming (though still pretty). I’d LOVE to go to the Seychelles…and for a week at that! There is definitely diving in the Seychelles, though I’m not really sure how it compares to diving in other parts of the world since I myself am not a diver! I do know that the visibility is supposed to be great though! You’ve written that Paradise Sun is on Anse Volbert but it’s on Cote Dor beach, which is not far from Anse Volbert (The only hotel on Anse Volbert is the La Reserve). Thanks for correcting! Many hotel websites have it listed on Anse Volbert, and that’s the only beach Google Maps really names in that area too! Hii just wanted to check if the localites hike the prices from tourists or they remain same throughout? Like for the activities and ferry prices? I can’t speak to individual tour companies, but ferry and food prices are standard – there’s no separate “tourist price” or anything. 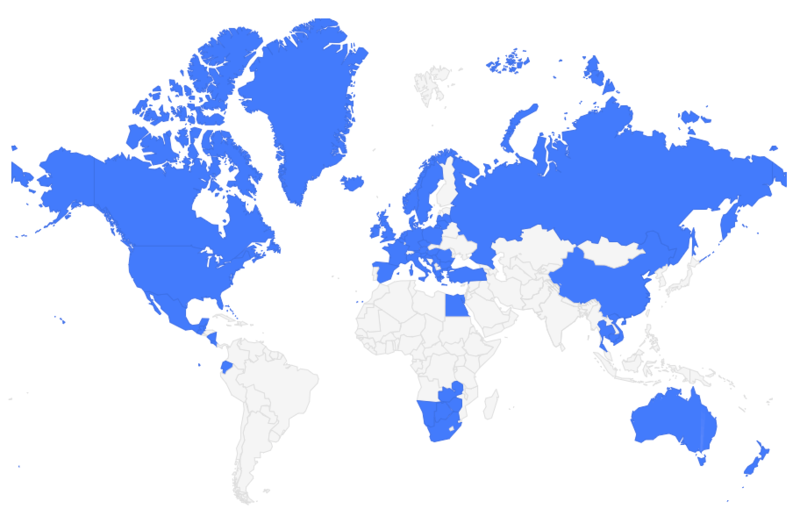 What is the best time to visit this country?? Thank you for sharing, Ohio gal! Planning for a trip to Mauritius and Seychelles in November. 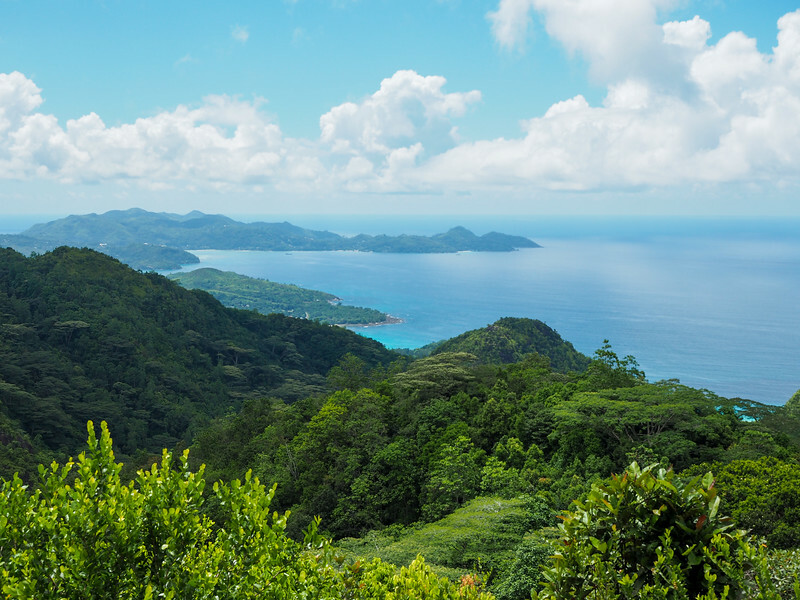 For Seychelles, would you recommend to stay in Baie Lazare or Beau Vallon? Or other choices? Are there restaurants within walking distance? I don’t have any personal experience in Baie Lazare, I’m afraid. But you’d be within walking distance to restaurants if you stay at Beau Vallon for sure. I’m a vegetarian. Do I need to worry? I don’t think so. They do serve a lot of seafood in the Seychelles (for obvious reasons! ), but you should be able to find plenty to eat as a vegetarian too. how can i buy tickets to go these islands. Hi Nada! I can only really speak to my own experience here, but I appreciated having half-baord at my hotel, since my hotel wasn’t super close to any restaurants – I would have had to take a taxi to go out to dinner at night. It was kind of nice not to have to stress about it! As for the other questions, you can book ferry tickets online in advance here – https://www.seychellesbookings.com/cat-cocos. And I would maybe ask at your hotel about snorkeling, as I did not do that on Mahe itself. Wow! 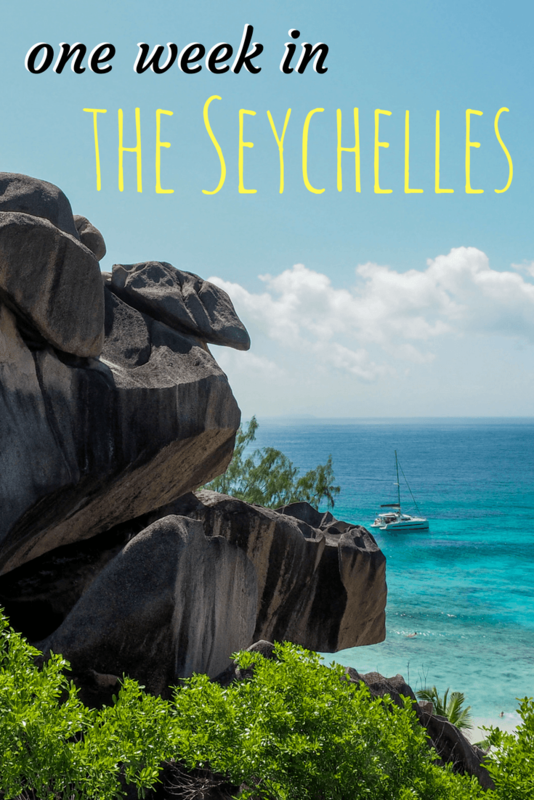 This is such a great one-week overview of the Seychelles. Extremely helpful! I was looking for an overview of main things to do/places to see and this is more helpful than you realize in planning my trip! Thanks so much!